Is Jackie Braasch Lesbian ? Jackie Braasch was raised in Illinois surrounded by race cars and race tracks. She is a professional motorsports racer especially known for drag car racing. She is a member of Car Chix which is a women motorsports organization. Her career on one side, she is also known for her relationship with the famous racecar driver Justin Shearer a.k.a Big Chief. Jackie was born on July 4, 1990, in Joliet, Illinois. Born into a family of professional race car drivers, she was exposed to the racing world at quite a young age. Her father was always working on cars in the garage. Tuning the cars up for the races was his specialty. Jackie would always help him out by handing him tools. This day to day activity and a sporty environment made her fall in love with the cars and the races as well. 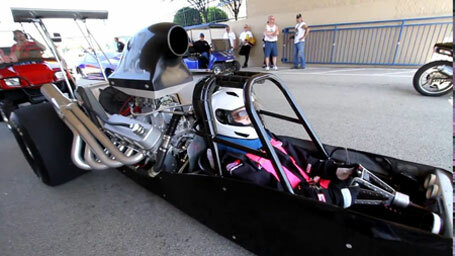 Her passion and love for cars made her join the Junior Dragster Division for children. That was when her days on the track began. She spent most of her time on the track or at the garage. Jackie owns the Spitzer Dragster. She competes in the Rocket Brand Race Fuel Bracket Series and Super Pro. When her skills improved, she won several championships. On 2014, she came in the top 12 out of 389 in the Car Chix. She ultimately became the Car Chix girl for May 2015. Recently, she has also been involved in teaching preschool kids. Jackie is a successful streetcar racer. She has been at the top of her game since childhood winning drag race junior competitions. Her relationship with another streetcar racer brought her to light. Justin Shearer a.k.a Big Chief was a married man, now divorced. He even has had two children with his former partner Alicia Shearer. Braasch is ready to race! Jackie came to the light because she is dating a married man. She mostly received negative feedback as she was accused of ruining the relationship of a married couple. Along with all of the negative comments, she would also receive positive feedback due to her major achievements in her career. She was already a celebrity because of her Drag races. The relationship with Big Chief has only been an asset to her. Jackie started racing when she was only at the age of eight years old. She has been involved in both the track and the garage. As of late 2018, the authoritative sources have determined that Jackie's net worth is over $1 million which is partly earned from prize money and partly from her expertise in mechanical skills. Justin Shearer aka Big Chief born on the 9th December 1980 in Louisville, Kentucky USA is Jackie Braasch's boyfriend. He is a street car racer. He also appeared in the reality show Street Outlaws. Jackie and Justin met during a race event. It is said that Justin was at awe when he saw Jackie on the track. Since then, they have been spotted together occasionally. Justin is said to have a knack for hiding his personal life from the media. Justin and Jackie met at a racecar event where Justin was at awe when he saw Jackie on the track. They have had numerous encounters since then.